Takashi Murakami’s kawaii works inspired his reinvention of the « Monogram » for the Louis Vuitton by Marc Jacobs Spring/Summer 2003 Show (which unveiled the « Eye Love Monogram », « Cherry Blossom » and « Monogram Multicolore » lines of bags ; moreover, Takashi Murakami directed the animated manga « Girl meets Monogram », about the Panda, Flower Hat Man and Onion Head characters he created for this show ; these characters were spotlighted in the « Superflat Monogram » exhibition at the Emmanuel Perrotin Gallery, in Paris, during Spring 2003). Some Takashi Murakami’s collaborations : Issey Miyake (in 2000, Takashi Murakami collaborated on the « Kaikai Kiki » collection, designed by Naoki Takizawa for Issey Miyake), Louis Vuitton by Marc Jacobs Spring/Summer 2005 (cherry-printed line of bags, in collaboration with Takashi Murakami), Louis Vuitton by Marc Jacobs 2007 (Takashi Murakami designed exclusive pieces, named « Art Products », for the Louis Vuitton pop-up shop at the Los Angeles Museum of Contemporary Art, to accompany the «©MURAKAMI » exhibition, presenting his collaborations with Louis Vuitton), Louis Vuitton by Marc Jacobs 2008 (« Monogramouflage » line of bags and scarves, in collaboration with Takashi Murakami, launched on July 1, 2008 ; moreover, for Christmas 2008, Takashi Murakami decorated the building of the New York Louis Vuitton flagship store, on 5th Avenue), Louis Vuitton by Marc Jacobs 2009 (« Insolite Monogram » line of wallets, in collaboration with Takashi Murakami, launched in April 2009, and echoing Takashi Murakami’s digital work, « Superflat 2 » ; moreover, in 2009, Takashi Murakami designed the cover of the deluxe edition of the « Louis Vuitton : Art, Fashion and Architecture » book, published by Rizzoli, and directed the animated feature film « Superflat First Love », for Louis Vuitton), Louis Vuitton by Marc Jacobs Spring/Summer 2010 (« Cosmic Blossom » line, in collaboration with Takashi Murakami, featuring accessories and clothes), Lucien Pellat-Finet 2002 (Takashi Murakami designed motifs for sweaters). The metallic dresses of the Balmain by Christophe Decarnin Spring/Summer 2010 Show were inspired by Tina Turner’s in George Miller and George Ogilvie’s « Mad Max Beyond Thunderdome ». Other George Miller’s « Mad Max »-inspired collections or items : Alexander Wang Spring/Summer 2009 (jewelry line, launched on February 14, 2009, in collaboration with Abraxas Rex, influenced by Tina Turner in « Mad Max Beyond Thunderdome »), Christian Louboutin Spring/Summer 2012 (« Lady Max » shoes, in leather and metal), Diesel Spring/Summer 2012 (« Bad Max » sunglasses), Dondup Autumn/Winter 2012-2013 (« Mad Max » was the starting point of this collection, made for a « Mad Woman »), Jean Paul Gaultier Spring/Summer 2001 (partly), Louise Amstrup Autumn/Winter 2009-2010 (the theme of this collection was a « Mad Max Beyond Thunderdome » kind of apocalyptic world), Louis Vuitton by Camille Miceli Spring/Summer 2009 (« Mad Max » earrings), Norisol Ferrari Autumn/Winter 2012-2013 (« Jean Harlow meets Mad Max » was the theme of this collection), Pièce d’Anarchive Spring/Summer 2012 (some pieces mix a « Mad Max » warrior-style with flowers), Rafael Lopez Autumn/Winter 2002-2003 (some items, mixing fabric and fur, evoked the « Mad Max » clothes), Rodarte Spring/Summer 2010 (in part), Todd Lynn Autumn/Winter 2011-2012 (partly). Pineapples inspired motifs on T-shirts and swimsuits in the Chloé by Stella McCartney Spring/Summer 2001 Collection (this motif will be re-released in February 2013 for Chloé’s 60th anniversary). Other collections with pineapples : Adidas by Stella McCartney Spring/Summer 2010 (« pineapple » printed vest), American Vintage Autumn/Winter 2010-2011 (« Mesh Pineapple / Maille Ananas » line, featuring honeycomb knitted sweaters), Dsquared² Spring/Summer 2012 (small 3-D pineapples on leather sandals), Jaeger Spring/Summer 2012 (« pineapple » motif on a cotton T-shirt), Juicy Couture Spring/Summer 2012 (« pineapple » charm on a metal necklace), Lulu & Co Studio Spring/Summer 2012 (T-shirt with a « pineapple » print), Relax by Tommy Bahama Resort 2009 (« pineapples » motifs on swimsuits), Salinas Spring/Summer 2013 (« pineapple » prints on swimsuits), Sunny Girl 1975 (swimsuit with a « pineapple » motif), Swash Spring/Summer 2012 (« pineapples » motifs on a silk jacket). 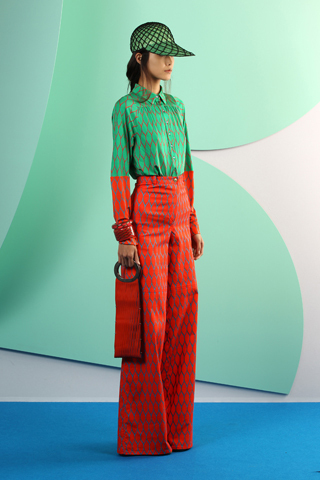 Ellsworth Kelly’s colors (when he was living in Paris) inspired the Kenzo by Humberto Leon and Carol Lim Spring/Summer 2012 Collection. Other Ellsworth Kelly-influenced collections : Abaeté Resort 2009 (inspired by Ellsworth Kelly’s paintings), Giles Autumn/Winter 2006-2007 (based on Ellsworth Kelly’s works), Matthew Ames Spring/Summer 2010 (influenced in part by Ellsworth Kelly’s paintings), Proenza Schouler Spring/Summer 2007 (Ellsworth Kelly-style stripes). Lady Gaga was the muse of the Mugler by Nicola Formichetti Autumn/Winter 2011-2012 Show. Some Lady Gaga’s collaborations : Alexander McQueen Spring/Summer 2010 (Lady Gaga’s song, « Bad Romance », was premiered during this show, dubbed « Plato’s Atlantis »), Barneys New York (for Christmas 2011, Lady Gaga was the curator and the designer of the Gaga’s Workshop, in collaboration with Nicola Formichetti, Assume Vivid Astro Focus and Dennis Freedman, that featured exclusive items), Giorgio Armani (the couturier designed several costumes for Lady Gaga, including for her « Monster Ball » tour, in 2010, and for her « Born This Way Ball » tour, in 2012), Hedi Slimane (in 2009, he photographed Lady Gaga for the sleeve of her re-released « The Fame Monster » album), Jean-Claude Jitrois (in 2009, Lady Gaga was the muse of the Jean-Claude Jitrois’ leather clothes), Jean Paul Gaultier (the couturier interviewed Lady Gaga for Alex Fighter’s documentary, « Gaga by Gaultier », aired on June 9, 2011, on French TV channel TF6), M.A.C (in 2010, Lady Gaga and Cyndi Lauper were the stars of the « Viva Glam » campaign, to support the M.A.C Aids Fund), Mugler by Nicola Formichetti Spring/Summer 2012 (a short film, featuring Lady Gaga, shot by Inez Van Lamsweerde & Vinoodh Matadin, was projected during this show), Mugler by Nicola Formichetti Autumn/Winter 2012-2013 (some outfits evoke Lady Gaga’s style), Philip Treacy (in 2010, he designed hats for Lady Gaga’s « Monster Ball » tour), Prada (in 2009, Miuccia Prada designed a dress for Lady Gaga’s performance at the Los Angeles Museum of Contemporary Art), Uniqlo (Lady Gaga was one of the celebrities who designed a « Fashion Unites for Japan » T-shirt, launched on June 28, 2011, in collaboration with the Japanese editions of « GQ » and « Vogue », to support the survivors of the Japanese earthquake). Lady Gaga-inspired items : New Yorker Spring/Summer 2010 (« Lady Gaga » printed T-shirt), Yazbukey Spring/Summer 2010 (« Lady Gaga » Plexiglas necklace). Moreover, the « Lady Gaga à gogo » exhibition, at the Galerie Chappe, in Paris, from October, 21 to October 29, 2010, presented items made by designers who had worked with Lady Gaga. The hybrid creatures of the Alexander McQueen Spring/Summer 2010 Show, « Plato’s Atlantis », referenced the underwater world we could live in because of climate change. Other climate change-inspired collections : Alba Prat Spring/Summer 2011 (inspired by the aquatic world, this collection, named « Synthetic Ocean », featured « carapace » neoprene outfits, referencing the underwater creatures forced to protect themselves because of global warming), Charles Anastase Autumn/Winter 2010-2011 (this collection, dubbed « Winter Garden », evoked the fact that because of climate change, summer fruits are obtainable during winter), Hussein Chalayan Autumn/Winter 2007-2008 (the theme of this collection, called « Airborne », was the consequences of history on climate changes), Kenneth Cole Spring/Summer 2010 (« Is It Me, Or Is It Warm … » slogan on a T-shirt), Lacoste by Felipe Oliveira Baptista Autumn/Winter 2012-2013 (inspired by J.G. Ballard’s « The Drowned World » book, especially the « Iguanas » chapter, the theme of this collection was the idea of the carapace, the protection and the superposition to adapt to an underwater world, because of climate change), L.E.N.Y. (since 2007, Mariel Gamboa’s Limited Edition New York project supports Al Gore’s Climate Project by releasing ecoconscious pieces, especially T-shirts, designed by celebrities), Marc Jacobs (in 2007, he launched a tote with the « Give’ em Hell Al ! » slogan, paying homage to Al Gore, sold to fight climate change), Moschino (in 1994, Moschino launched the 1st ecological line, named Ecouture !, using ecocompatible fabrics and pigments), TRIAS Autumn/Winter 2011-2012 (collection showcasing clothes made in new fabrics to adapt to a warmer climate), Vivienne Westwood Autumn/Winter 2009-2010 (dubbed « + 5 degrees », this collection referenced global warming), Vivienne Westwood Spring/Summer 2010 (« Act Fast, Slow Down, Stop Climate Change » slogans on pieces and on the flyers of this ecoconscious collection), Woolrich Woolen Mills Spring/Summer 2013 Menswear (collection named « Arctic Meltdown »). 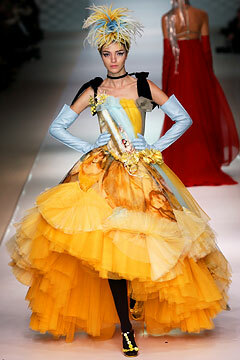 The « Corps de ballet » dress of the Jean Paul Gaultier Couture Spring/Summer 2003 Show was inspired by Edgar Degas’ ballerinas. Other Edgar Degas-inspired collections or pieces : Charles Anastase Spring/Summer 2009 (inspired in part by Edgar Degas’ ballet dancers), Dennis Basso Spring/Summer 2010 (bubble skirts reminiscent of Edgar Degas’ ballet dancers), Dior Couture Autumn/Winter 2005-2006 (looks 33, 34 and 35 : « Degas Dancers »), French Sole Autumn/Winter 2011-2012 (a 7-shoe line, inspired by Edgar Degas’ « Little Dancer, Aged Fourteen » sculpture, was launched, in collaboration with the London Royal Academy of Arts, to celebrate its « Degas and the Ballet : Picturing Movement » exhibition), Givenchy by Riccardo Tisci Couture Spring/Summer 2008 (dedicated to ballet, this collection was inspired in part by Edgar Degas’ ballerinas), Jason Wu Spring/Summer 2007 (tulle dresses, reminiscent of Edgar Degas’ ballet dancers), Lorick Spring/Summer 2010 (based partly on Edgar Degas’ pastels), Rodarte Autumn/Winter 2008-2009 (cocktail dresses echoed Edgar Degas’ ballerinas ; moreover, Edgar Degas’ « Little Dancer, Aged Fourteen » sculpture, at the Norton Simon Museum, in Pasadena, inspired the dancers’ tutus that Kate and Laura Mulleavy designed for Darren Aronofsky’s « Black Swan »).